I have to say that when it comes to design and art the Japanese are often onto something. The Chicago Botanic Garden has many examples of Japanese horticulture but the Bonsai is special. When the sun goes down and these displays are lit from underneath, they invite me to think of them as completely different displays and sometimes I think of them as completely different worlds. But this time it was a little rainy and that really made them special. This Bonsai tree was lit from underneath at an outdoor display while it was raining. I have to say that I don’t know the names of most of these flowers at the botanic garden. All I know is when a flower stands out from the rest! These colors definitely work for me. It was after a rain, and water was still present on the flowers. I hope you like it! More colors at the Chicago Botanic Garden after the rain. This is the main waterfall at the Chicago Botanic Garden. It is displayed just before entering the Japanese gardens. For this photo, I took a bracket of three ND filtered photos so the long exposure would help the water to look the way it does. I also experimented with layering the images so I could further limit the ghosting. It’s exciting to try these techniques. I am glad I get a chance to try this out before going to Yellowstone this Saturday. #fivedayquest DAY 5. Invited by +Mihoko Yamanashi . This is my last one of the 5 day set. What better ending than a sunset? The clouds really came out. A few days ago I questioned if I’d get one last good day in this set. But this was it! I also briefly met +Anna Ryndak there. I have to admit, I thought I was going to leave right after running into her but then I saw this post-sunset blaze in the sky and new I had to take one last try! The +Chicago Botanic Garden really puts on a good display. And over these 5 days, I saw a lot of flowers come to an end and a few new ones begin. It’s constant change over there. Just because you went yesterday, doesn’t mean you’ll see the same thing today! Who do I chose? I already mentioned her. +Anna Ryndak , since I met you at the garden, you’re it! It’s always fun to meet another G+’er! Remember, just use the tag, #fivedayquest , tag me, invite a new person every day for five days. +Chicago Botanic Garden #fivedayquest Day 3. +Mihoko Yamanashi invited me to participate in this and I accepted. Today was rainy and crappy out. Generally not ideal conditions for photography. BUT! I am going on a vacation to several National Parks starting with Yellowstone on 6-21-2014. I am fully aware of the fact that weather could be crap there too. So, I went and bought a new pair of waterproof hiking boots and a rain jacket and they both performed excellent while walking around the Botanic Garden. So, I went through their tropical rainforest green house. And because the sky was already so dark, all the ground lights of the garden were coming out and I saw these palm trees lit. BUT I didn’t have a tripod. This was handheld. It was noisy as heck. But I felt that it was fun to look at. For this day, I want to invite my twin brother, +Anthony Dooley . I gave him my old camera and he’s not let go of it since. It’s a point and shoot, technically speaking, but he’s got a good eye for it. Tony, you can start this at any time. The idea is to show daily life for five days in a row. All you need to do is tag who invited you, and use the hashtag, #fivedayquest. I really like lilies. I believe that this is a Stargazer Lilly. 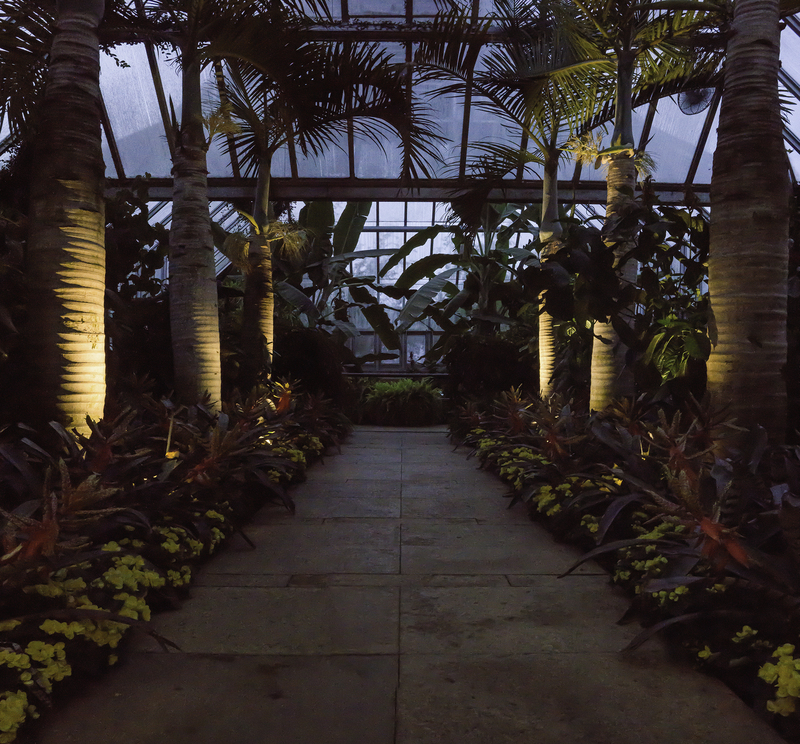 It’s in a central atrium at the Regenstein Center at the Chicago Botanic Garden. I was surprised by the dynamic range of the setting! So many rich colors and dark tones that I had to use multiple exposures. I hope you enjoy this one. It’s just nice to look at. +Mihoko Yamanashi invited me to run the #fivedayquest again. And I accepted. This time I’ve decided to run to the Chicago Botanic Garden for each of these days after work, take photos, process them, and post them. I turn in my assignments late. Always have. My teachers in high school failed. +Karina Kaefer , I CHOOSE YOU! You are invited to the 5 day quest. I hope you understand this. But since I saw your stream has a lot of flowers in it and I’m going to a botanic garden a lot lately, you, get the invite. The #fivedayquest is simple. You must use the tag, #fivedayquest , and you must also tag the person who invited you. You can start whenever you feel like. You post for five days. And each day you invite someone new. That is all. +Lauri Novak you’re not invited to do the quest again, you’re popular enough. And you’re actually on your way to Germany by now, but really, you need to go to the +Chicago Botanic Garden .